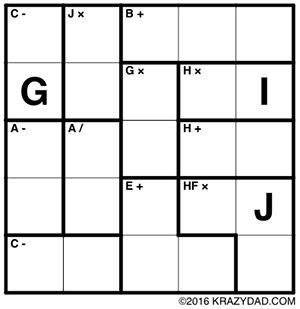 Krypto Inkies (a Krazydad original puzzle) are regular Inky (or Kenken) puzzles that have been encrypted. Each digit has been substituted with a letter. To solve the puzzle, you must deduce what digit each letter stands for, while working out the solution to the decrypted puzzle. These puzzles are intended for solvers who are already pretty good at solving regular Inky or KenKen puzzles, so if you haven't solved any of those, I suggest you solve a few regular Inky puzzles first. My Krypto Inky puzzles are available in 3 sizes. Each volume contains 100 printable booklets. Within each volume, the books are ordered by ascending difficulty -- so Book 1 contains the easiest puzzles (which are still quite challenging, you'll find) and Book 100 contains insanely difficult puzzles. Each booklet contains eight puzzles and a page of answers. These smaller puzzles are easier -- I suggest starting with them if you haven't tried these before.. These are the largest Krypto Inky puzzles I currently publish. If you want larger ones, let me know!